Do You Know These Pizza Facts? Hey there, and welcome back to our blog! If you’ve been keeping up with us, you are probably more than aware of the fact that we here at Five10 Pizza in Oakland are crazy about pizza. Not crazy in a “set your clothes on fire after a breakup” way but more in a “talk about pizza and pizza facts for hours at a time” crazy. You see, we have dedicated our time and efforts to providing the residents of Oakland with the best New York style pizza that they have ever had. In order to do this, we have to be a little crazy. The crazy gives us that little edge that we need to not only be better than our competitors, but to also make our pizza the best that it can be. In today’s post, we are going to continue where we left off last time and continue to go over some interesting pizza facts that you, the reader, may not know. Keep reading below to learn more! No matter where you go in the United States, it seems like a pizza place is not that far away. Pizza has, more than many other foods, made its way into the list of staple dishes that everyone seems to agree are delicious. 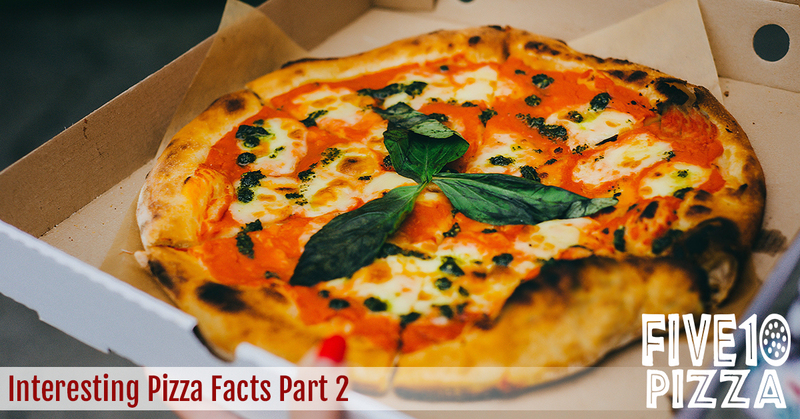 Because of its popularity, pizza has been the subject of quite a bit of research and, below, we have listed a few more of our favorite facts that we have come across. Even though you might think of pizza as an entirely modern invention, it has been around for hundreds of years. Alexandre Dumas, author of The Three Musketeers, traveled to Naples, Italy in 1835 and noted that the Neapolitan poor ate nothing but pizza during the winter. In 1974, the first pizza was ordered by computer. Researchers at the Artificial Language Laboratory at Michigan State needed to test out their new “speaking computer.” They used their new computer to order a pepperoni, ham, mushroom, and sausage from a local pizza pace down the street. Working for a pizza place is a profession that many people have found themselves doing. Both Bill Murray and Stephen Baldwin worked at pizza restaurants when they were younger, and famed action star Jean Claude Van Damme used to deliver pizzas. Hoping to meet the cravings of soldiers abroad, the U.S Military Lab recently developed a ready-to-eat pizza. This pizza takes absolutely no preparation time and, reportedly, lasts up to three years. After years of research studying the baking properties of different cheeses, scientists in 2014 finally found scientific evidence for a face that most people already know—mozzarella is the best cheese to use on pizza. Thank you for taking the time to read our short blog series on some interesting pizza facts that we have collected from around the internet. If you’re hungry after reading this post, please visit our Oakland location today and enjoy a slice of our world class, New York style pizza!